With four car rental offices in Mannheim, Sixt ensures that collecting your vehicle is straightforward no matter how you arrive. We have rental desks at both Mannheim Airport and Mannheim Central Train Station. It is also possible to collect your Mannheim car hire from two other convenient city suburb locations. One is an office in the Neckarau district and another is located in the BMW showrooms on Neckarauer Strasse, so no matter where your hotel is located we make picking-up your car rental in Manheim stress-free. A quick scroll through our drop-down list reveals exact directions to all four rental offices in the city. Click on the second tab of our branch menu to open a useful overview map showing Mannheim rental locations. Individual branch pages give exact addresses and useful information about opening times. Three of our branches offer 24-hour pick-up and return services giving you total journey flexibility. A quick car hire price comparison will highlight our affordable prices, so take advantage of them by booking online or calling our reservation number. We do our utmost to provide customers with the vehicle of their choice but are unable to guarantee specific models. We are always on hand to help, whether you need a rental for one hour, a day or longer. We are proud to offer an extensive fleet of vehicles for your car hire in Mannheim. Economy and family saloons are excellent value options or treat yourself to a premium drive with sports models and convertibles from luxury brands such as BMW, Audi, Mercedes-Benz and Porsche. Choosing a 4x4 is aperfect for exploring the German countryside, while larger family or business parties can be accommodated in our comfortable range of minibuses. We also have vans available if you have goods to transport. Please note that we are able to provide vehicles designed to meet different mobility needs. Add extra value to your stay with our attractive range of extras. Sat Navs help you navigate city streets, while insurance options and child seats ensure that safety is paramount. Share the driving by opting for additional driver cover and if you are visiting in the Winter months and plan on doing some countryside exploring we recommend snow chains and cold-weather tyres. If you are arriving on an internal flight from Berlin or Hamburg your plane lands at the small Mannheim Airport, a short drive from the city on the main A6 road. Mannheim is fairly easy to navigate, having five major highways that circle and radiate outwards from the centre. Taking advantage of a Sat Nav is definitely a good idea. International flights land at Frankfurt Airport, from where high-speed trains bring you into Mannheim Central Station. Tram lines 1, 3, 4, 5, 8 and 9 give easy city access to the station and our rental cars are located at ground level. Both the Neckarau and BMW offices are a few miles outside the city centre and accessible by localtransport. Once you have collected your car hire you are ready to start exploring the city of Mannheim. Visit the famous Water Tower, the district of Ludwigshafen just across the river or head off to other neighbouring German towns. If you are visiting Mannheim on business, your car rental gives you quick access to the industrial and business parks that surround the city. You will find plenty of multi-storey car parks available and convenient for all tourist attractions and length of stays. Like most German cities, Mannheim operates an inner-city environmental zone. Don't worry, all of our vehicles meet the emission requirements. A major quirk of Mannheim is it city centre layout. Designed on a grid pattern like a chess board, the streets have letters and numbers rather than names, which can all be a bit unsettling when you first arrive. You quickly get used, however, to navigating by blocks rather than streets. Don't worry if you get lost, just ask a local, they are used to directing visitors. Once a small fishing village and later the home of Goethe and Mozart, Mannheim is now a bustling and vibrant multilingual community, a temporary home to many US army personnel and a base for business giants such as John Deere, Daimler and IBM. Enjoy a lively nightlife centring on venues that range from Irish pubs like Murphy's Law to the relaxed SOHO jazz club with its extended happy hour. A more radical nightlife can be experienced at Blau, while both Onyx and Café Bernstein are popular places for drinks and light snacks with both locals and visitors. Culture vultures can visit the National Theatre and take in a different ballet, opera, play or comedy show on every night of the week. Heidelberg is a jewel of German destinations and just a short hop away in your rental vehicle. Sitting on the beautiful River Neckar and surrounded by the legend-rich Forest of Odin, Heidelberg is a gem to stroll around with its medieval and Baroque streets. Heidelberg Castle is set in beautiful grounds while stretching your legs with a walk up the Heiligenberg Mountain rewards you with a panoramic view across the OldTown. A fantastic drive to take from Mannheim is the iconic Bertha Benz Memorial Route. This journey of 120 miles follows the first long-distance car journey, made by Bertha Benz in 1888. As well as following history, you will be driving through some of Germany's most scenic areas, including the Baden wine district. The route ends at Pforzheim in the Black Forest. You might even be tempted to stay overnight and enjoy a pleasant weekend on its hiking trails. 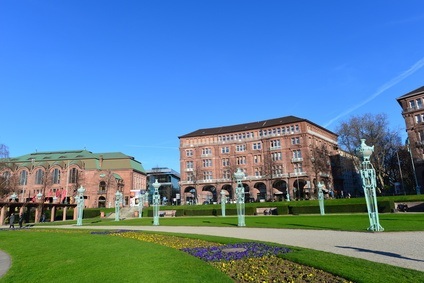 Germany is full of delightful destinations like its oldest city, Worms. The impressive fairytale entrance to Worms arches over a Rhine road bridge. The river here is full of salmon and clean enough to be popular with swimmers, tempting if you are visiting on a hot day. Step into the shade of the Romanesque cathedral to enjoy its magnificent stonework. 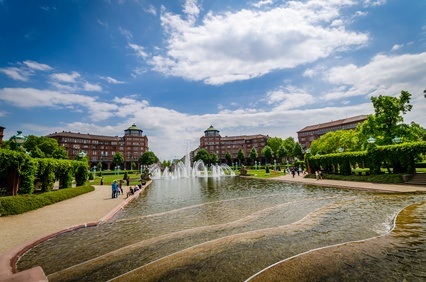 With so many major industries and high-tech businesses having offices and plants in Mannheim, the city is an important destination for business travellers. Throughout the year there are numerous conferences and seminars at venues throughout the city. Regular conferences are held in the Congress Centre. Located in Rosengarten it is an interesting blend of an old red-brick building with modern glass architecture. It is possible to take your rental car across national borders, but this is dependent upon the country you will be entering and the type of vehicle you are renting. For further information, please visit our dedicated rules and restrictions page to find out what applies to your journey. For more information regarding what's covered in our protection programmes, visit our Insurance FAQs. Yes, although this may incur a one-way rental fee that will be shown during the booking process. Please note: one-way rentals may be restricted if you plan on crossing borders. For more details, visit our one way car hire page. It is perfectly possible to make changes to your booking, but please note that any fees incurred may vary dependent upon your booking. For more detailed information please read our amendments, cancellations and extentions FAQs. If you can not find an answer to your question above, please visit our car hire FAQs or rental information for more detailed information.